Infiniti QX80 Forum > Infiniti QX80 Forums / Infiniti QX56 Forums > Infiniti QX80 News > Does the Nissan Armada Look Better Than the Infiniti QX80? 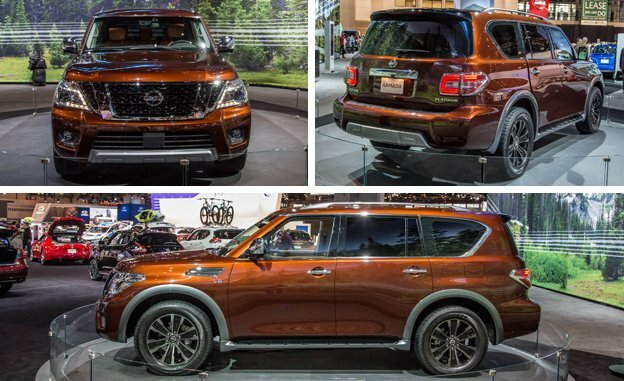 Does the Nissan Armada Look Better Than the Infiniti QX80? The Infiniti QX80 is an impressive full-size SUV with a massive array of luxury, tech and safety features, as well as a quite pleasant driving experience considering the weight and power of the vehicle. Unfortunately for Infiniti, the one area that the QX80 has missed the mark on is its styling (in my opinion). Things are a bit too bulbous, chrome is a bit too plentiful, and while I understand that it is a full-size SUV, it just seems a little inflated to me. It's been taking a little time out of the spotlight, but now it's back. The 2017 Nissan Armada made its return last month, and although it is the cheaper version of the QX80 -- sharing many elements, but going with more "economy" choices for others -- I'd like to argue that the Nissan Armada actually is a better looking vehicle than its upscale sibling, the Infiniti QX80. First, let's discuss what is the same between the Armada and the QX80. The 2017 Nissan Armada shares a great deal with the Infinit QX80. Common between the two vehicles are the platform, the driveline, the engine, and a sizeable portion of the overall design. The interior too shares many similarities. The engine is the same in each vehicle -- Nissan's 5.6 liter Endurance V8. The Armada's engine has been tuned to produce 390 HP, a slight bit lower than the 400 HP of the QX80. Still, both vehicles have the same 8,500 LBS towing capacity despite that power difference. The two vehicles also have a similar helping of safety technologies including: Predictive Forward Collision Warning (PFCW), Backup Collision Intervention (BCI), Intelligent Cruise Control (ICC) and Distance Control Assist (DCA), Lane Departure Prevention (LDP), Lane Departure Warning (LDW), Blind Spot Intervention (BSI) and Blind Spot Warning (BSW). Is It Better Than the QX80? The Armada and QX80 are the same in many respects. What separates them is styling (mostly at the front with the grille and the hood), price and some of the more luxurious features. While we don't have any info on the content of the trim levels, we do know that there are three levels: SV, SL and Platinum. Depending on exactly what is contained in that Platinum trim level, the Armada could be an excellent luxury SUV. It could even appeal to some more than the QX80, especially given its lower price point. Would you consider buying the Nissan Armada over the Infiniti QX80 ? Do you think that the Armada looks better than the QX80? Having recently bought a 2016 QX80 Limited in late January I'd have to say the 2017 Armada are very close in appearance. I do think the 2017 Armada squared off front moves it a little closer mainstream and less polarizing. Will be interesting to see the interior and pricing. What sold me on the Limited was the interior ... I finally got used to the front end. Had I seen this before, I'd still chose the QX80 Limited. I thought similar when I bought my last Escalade; the Tahoe and Suburban were real close, but the Escalade was more refined and carried a little more status. This time, I wasn't going to sacrifice build quality (concerns) for status so chose the QX80 ... If I wanted status I'd got the Land Rover. That's just me. That's actually one thing I noticed a lot once seeing pictures and video's of them over in the Middle East since they seem to be selling extremely well over there. Massive market for these vehicles. It does make me feel slightly bad about the QX80 since they almost come too close. But this platform is soon due for change and we'll see a next generation QX80 in another couple years at least. Then the differences will be far more. it's going to be a matter of personal preference but the QX80 looks far superior to me and can easily sit beside a Range Rover HSE and not look out of place, the HSE being a vehicle about $50,000 more than it. But the Armada... just looks a toy next to that same HSE RR. I agree and have been seeing a growing number of QX80's around, seems like the recent changes that Infiniti made really hit a special note with shoppers in the segment. Glad you guys are noticing it too. Started seeing some as Uber vehicles and limos, easy to spot them... if it's black with really dark tints...someone is being driven in it, or will be.